The disease is that illness or defect in a human body which brings the immune system in work. Either the disease may be chronic, transferable, and non-transferable. Science has found medicines for the cure of these different types of diseases. People nowadays are safe because of such great medicines available for a cure of those diseases. But in this world there are such types of diseases which are not still answered by science and the medicine for the complete cure has not been found yet. 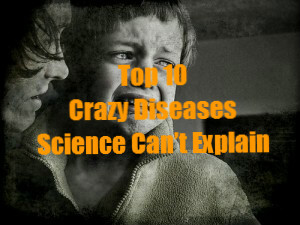 Amongst those diseases in this article, you can find the Top 10 Crazy Diseases Science Can’t Explain. When this disease hits patient then hallucinations makes them in trouble. Then after the patient becomes asleep but was in the fully conscious mode. Many people died due to this disease and who escaped death also faced very terrible experience entire their life. This disease has the syndrome like of the disease called polio. This disease was mostly seen in children and it leads to weakness as result paralysis occurred. This disease terrified most of the parents at that time. This disease was named after the place where it was found in Germany in the year 1967. This virus caused the high fever to the patient and was transferred from monkeys to human and basically caused internal bleeding. Those who were affected by this disease used to complain about the loud bangs in their head. Doctors were left blank with the idea what does it mean to them. This kind of disease was responsible for death of many infants of 1 month to 1-year-old. It was very tragic that infants used to be dead while they were in their sleep. And the cause of this disease is still unknown. By the name aquatic it reveals this disease is related to water. When patient are affected with this disease they will have a painful reaction in the skin when they come in contact with water. It is named after the town of the evolution of this disease. This disease caused the patient to have up to 20 episodes of diarrhea every day until one year. The official name of this disease is bovine spongiform encephalopathy. This is a very fatal disease which turns brain of the cow into mush. It is dangerous neurodegenerative disease found in this world. It is considered as a mental illness than anything other. The patient complains about the illness when they come in influence to the electromagnetic fields. The patient uses to feel the muscle gets stiff and stiffer gradually resulting paralyzed. Doctors are amazed at this and they are not sure about the exact cause. However, they concluded it was due to diabetes or mutated genes problem. These are top 10 amazing and crazy diseases which science was unable to answer. Now people are lucky because they have medicine for almost all kind of disease which are in existence.